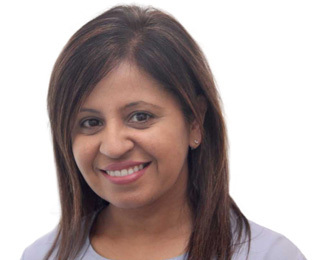 Over the many years that Neeta has worked at Blue Court Dental her role has changed from being in a clinical environment to now being at the front desk. She is our longest standing team member, having been with Blue Court Dental since it started. Being the first point of contact, it gives her great satisfaction to know that the patients are given a warm welcome and made to feel at ease. Getting to know each patient individually enables her to respond promptly to his or her needs and requests. Outside work, Neeta enjoys keeping fit and spending time with her family. Having worked as a dental nurse for many years and attended numerous courses I have developed a great depth of understanding and am able to talk to patients about treatments. Whether it is something that they are unsure or unclear about, I am able to provide them with the right information. I am very passionate about what I do and enjoy every aspect of it. It has given me a great sense of responsibility and through clear communication and organization I am able to deliver. Patient care is very important to me so taking the time to get to know the patient gives me great pleasure. There is a team called Manchester United, Over which many people get very excited, But I know a team with much more appeal, So full of humour and professional skill. So thank you Nishan you're a team so united, To make all your patients so really delighted!